In a bowl mix the worcester sauce, agave, veinagar and sesame oil. Place tofu in a tray large enough so that each piece has space around it. Drizzle with marinade, and let it sit for a couple of hours, turning over every half hour. Remove the stalks from the mushrooms, then in a bowl toss them (whole) with a tablespoon of olive oil. Set aside. Heat your grill (I used an electric one), and place all the mushrooms on it. With the one I used, because it is also a sandwich press, there was no need to turn it over. Remove when nicely seared on both sides. Repeat with the tofu. Reserve tofu marinade. Cook noodles as per packet instructions. Set aside. Heat a medium sized wok, and place 1 tablespoon of olive oil. Place onion, carrot, capsicum, garlic and ginger and stir fry for a few minutes. Add spinach and stir fry till wilted. Add tamari, stir well and remove from heat. 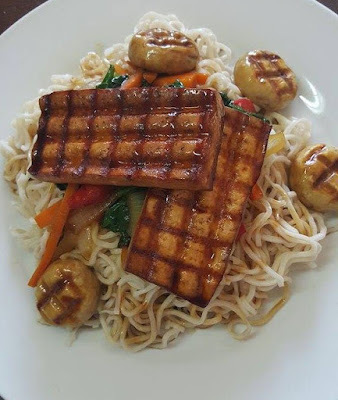 To serve, place the noodles on each plate, top with a mound of veggies, then two pieces of tofu, and a few mushrooms. Drizzle with a couple of tablespoons of reserved marinade. Can also sprinkle with dry chilli flakes.